SOUTHFIELD, MICH., May 18, 2017 – The American Cancer Society announced today that Adient, the world’s leading automotive seating and interiors supplier, will serve as presenting sponsor of its premier golf fundraising event, the Detroit Select Golf Invitational held on Monday, July 10 at Oakland Hills Country Club. “Adient is proud to be the presenting sponsor for this event supporting the American Cancer Society. Many of our employees and their family members have been affected by cancer in one way or another. This collaboration allows Adient to dedicate our time and effort to the fight against cancer alongside the ACS,” said John Moulton, vice president of Adient. The event will also welcome Golf Pro Rick Smith, named one of Golf Digest’s top 10 golf instructors in the world, as a special guest. Smith, CEO and President of Rick Smith Enterprises, Inc., has achieved great success in golf as a teacher, designer, communicator and visionary. He is regarded as one of the PGA tour’s best “sounding boards” for swing advice, serving as coach to some of the most accomplished golfers in the world who have collectively won 8 major golf championships including Phil Mickelson, (Four-Time Major Winner), Lee Janzen (Two-Time U.S. Open Champion), Rocco Mediate (2016 PGA Senior Champion) and Jack Nicklaus (1993 US Open Champion). Smith has also won dozens of awards and accolades for his skill as a golf course designer. Over 200 golfers are expected to attend the event, featuring 18 holes of golf on Oakland Hills North and South Courses, award opportunities for top teams, a cocktail reception and silent auction. In addition to presenting sponsor, Adient, Detroit Select Golf Invitational major sponsors include Dana Incorporated, Ernst & Young LLP, SKF, and Toyota. Detroit Select has raised over $1.7 million since its inception in 2003. All money raised at the event benefits the American Cancer Society’s work to fund cancer research, provide programs and services for cancer patients, and support cancer prevention and early detection. In the last two decades, cancer deaths have dropped by 22 percent or 1.5 million lives were saved from cancer that would have otherwise been lost to the disease. Limited space is still available for sponsorships. Sponsorships start at $5,000 for a foursome. Contact Heather Crowley for more information at heather.crowley@cancer.org or call 248.663.3468. (HARRIS, Mich.) – Island Resort and Casino – the Upper Peninsula’s esteemed vacation destination and home of the Symetra Tour’s Island Resort Championship – announces it has been named to Golf Vacation Insider’s list of Best Golf & Casino Resorts in the United States. Island Resort and Casino was one of few properties nationwide named to the top tier (Platinum). Read The GolfBlogger’s Sweetgrass Golf Club Review. Golf Vacation Insider employs a mathematician and statistician to analyze rankings, ratings and reviews from dozens of credible sources across golf, lodging, dining, and off-course activities to identify properties offering the best overall experiences. Named for one of the Potawatomi tribe’s traditional tribal medicines, Island Resort & Casino’s Sweetgrass Golf Club is ranked one of golf-rich Michigan’s finest via Golfweek’s “America’s Best Courses You Can Play.” Its sister course, Sage Run, may open as soon as late summer 2017. Both courses were designed by Paul Albanese of the golf course architecture firm Albanese & Lutzke, which is also constructing Sage Run. “Sweetgrass Golf Club is everything a casino golf course should be, and Island Casino complements it very nicely. We’re pleased to award the resort a place in the Platinum division of our list,” said Tim Gavrich, managing editor of Golf Vacation Insider. To complement its world-class golf, gaming and entertainment, Island Resort & Casino recently opened the all-new Drift Spa, one of resort’s many amenities. Owned and operated by the Hannahville Indian Community, Island Resort and Casino is located in Michigan’s scenic Upper Peninsula. Boasting more than 1,200 slot machines and 24/7 Vegas-style gaming, the Island Resort & Casino offers craps, Blackjack, Spanish 21, Three-Card Poker, Let It Ride, Roulette, Bingo and more. The resort’s award-winning poker room features live action as well as a full tournament schedule. The Island hosts top entertainment headliners from a variety of genres in the intimate, 1,327-seat Island Showroom. Lodging options at the resort include finely appointed guest rooms, 14 elegant suites and a 42-site RV Park. Brand-new Drift Spa, Sweetgrass Golf Club, a sports bar and multiple restaurants offer other appealing options. The property is easily accessible via a pair of regional airports in Escanaba and Marquette and is also an easy, scenic 2-hour drive from Green Bay (four hours from Milwaukee). Sweetgrass is ranked among Golfweek’s “America’s Best Courses You Can Play” by state. It provides a dedicated on-site golf concierge and VIP Room where groups enjoy comfortable living room-style seating, private dinners, gaming tables, beverage service, televisions and direct access to the golf course, pro shop and open fire pit. Island Resort and Casino is building a companion course, Sage Run, which is planned for a 2017 debut. For information, see www.sweetgrassgolfclub.com or call 906.723.2251. 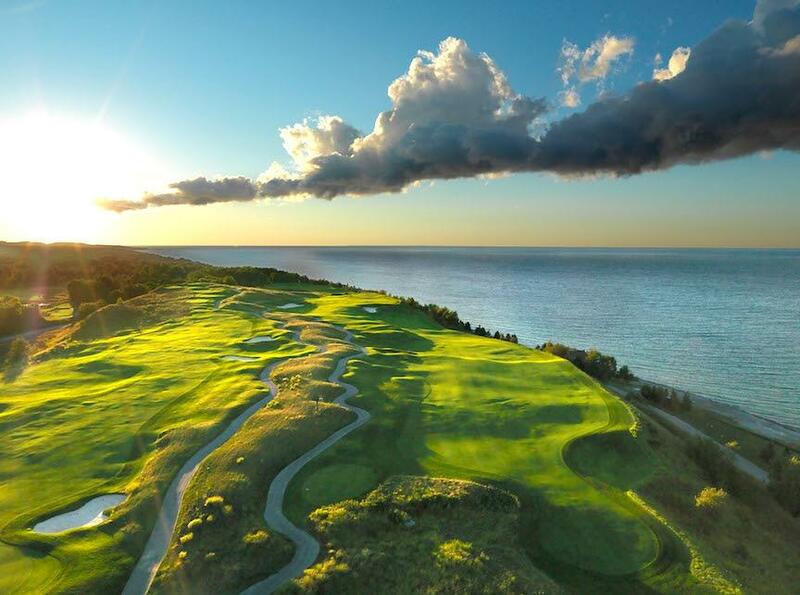 (PETOSKEY, Mich.) – BOYNE Golf – home to 10 premier courses spanning three resorts in the heart of “America’s Summer Golf Capital” – announces its Bay Harbor Golf Club has once again been ranked among America’s “Top 100 Courses You Can Play” by GOLF Magazine. Designed by Arthur Hills, the 27-hole club’s Links and Quarry nines have been mainstays in the bi-annual rankings since opening in the mid-1990s. Overlooking Lake Michigan’s Little Traverse Bay, The Links is reminiscent of Ireland’s famous seaside courses. Miles of shoreline form a backdrop of incomparable beauty, with undulating fairways and slick putting surfaces framed by scrub-covered dunes. Widely heralded as one of the world’s most unlikely locations for golf, The Quarry winds its way through an immense, abandoned shale quarry. Impressive gorges surrounded by stone cliffs, natural ponds and a gentle waterfall are hallmarks. With the leaves turning and summer crowds beginning to wane, fall is an ideal time to experience Bay Harbor Golf Club and neighboring resort, Inn at Bay Harbor. Available select dates between Sept. 4 and Oct. 5, the “Endless Summer Special” begins at $174 / night and includes overnight accommodations, breakfast for two in The Sagamore Room and access to enjoy resort amenities, including golf. Named a ‘Top Resort’ and ‘Top Spa’ by readers of Conde Nast Traveler, the Inn at Bay Harbor has been a “must experience” destination since opening in 1998. The next chapter in its history began in June when Autograph Collection Hotels, Marriott International’s curated portfolio of properties recognized for celebrating individuality, welcomed it into the collection. The Inn is one of just 100 Autograph-branded hotels worldwide, each of which has been selected for its memorable guest experience, bold originality, rich character and uncommon details. 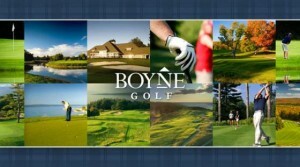 BOYNE Golf’s three flagship resorts offer experiences to suit players of all ages and abilities. Beyond golf, BOYNE’s unique on-property amenities include award-winning spas, waterfront dining, sandy beaches, Avalanche Bay – Michigan’s largest indoor waterpark, and adventure sport venues. They are supported by historic, lakeside resort towns Boyne City, Harbor Springs and Petoskey all a short drive from Mackinac Island. Following in Hemingway’s footsteps, taking in the famous northern Michigan sunsets, enjoying the casino and exploring acclaimed microbreweries mean golf isn’t the only game in town. 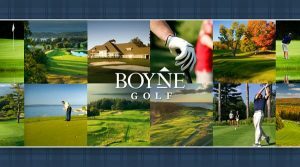 BOYNE Golf offers the largest collection of courses (10) in the Midwest shared among three resorts in northwest Michigan’s Petoskey area: Boyne Highlands Resort in Harbor Springs, Boyne Mountain Resort in Boyne Falls, and the Inn at Bay Harbor in Bay Harbor. Golfers play up to 72 holes daily thanks to the region’s long daylight hours and ideal temperatures. With courses suited to a wide range of playing abilities, accommodations for every taste and budget, world-class amenities and memorable off-resort attractions, BOYNE is a premier destination for vacationing golfers, families and meeting planners. (HARRIS, Mich.) – Sweetgrass Golf Club is rated one of the nation’s finest in GOLF Magazine’s “2016-17 Best Courses You Can Play” by state, a biennial compilation recognizing America’s best playing venues. Designed by golf architect Paul Albanese of Albanese & Lutzke, Sweetgrass holds the No. 15 position in golf-rich Michigan. The course and Island Resort & Casino are owned and operated by the Hannahville Indian Community, a band of the Potawatomi, and located in the pristine Upper Peninsula. Immaculate conditions, rescued Michigan Department of Transportation bridges, no surrounding development and a unique collection of green styles are Sweetgrass hallmarks. The Redan, Biarritz, island and shared greens are popular with all players – from every day golfers to professionals, including the Symetra Tour “Road to the LPGA” members who compete on them each summer. Sweetgrass (www.sweetgrassgolfclub.com) has previously received best-of honors from GOLFWEEK and Golf Digest magazines. This latest superlative follows news that the resort and tribe are building a second course – named Sage Run (also designed by Albanese) – for which a soft opening is planned for next year. The resort’s highly popular golf package – the “Perfect Foursome” – starts at $260 per person and includes a two-night stay and rounds of golf at Sweetgrass and nearby TimberStone and Greywalls (all three ranked on Golfweek’s top-15 in the state). Various other package combinations – as short as one-night stay/one round of golf and as long as a four-night stay/three rounds of golf – are also available. Sweetgrass provides a dedicated on-site golf concierge and VIP Room where groups enjoy living room-style seating, private dinners, gaming tables, beverage service, televisions and direct access to the golf course, pro shop and open fire pit. Boasting more than 1,200 slot machines and 24/7 Vegas-style gaming, the Island Resort & Casino (www.islandresortandcasino.com) offers slot machines, Craps, Blackjack, Spanish 21, Three-Card Poker, Let It Ride, Roulette, Bingo and more. The resort’s award-winning poker room features live action as well as a full tournament schedule. The Island hosts top musical headliners from a variety of genres in the intimate, 1,327-seat Island Showroom. Lodging options at the resort include finely appointed guest rooms, 14 elegant suites and a 53-site RV Park, open until Nov. 30. In addition to Five Bridges Pub and Five Bridges Steak and Seafood House, other on-site resort dining options include Firekeeper’s Restaurant, which specializes in casual dining, Coral Reef Grille and the new T. McC’s Sports Bar, with a menu that ranges from classic appetizers to burgers and specialty wraps. The property is easily accessible via a pair of regional airports in Escanaba and Marquette and is also an easy and scenic four-hour drive from Milwaukee and two hours north of Green Bay. Meier, who made her professional debut in 2015, was in the Top 100 on the Symetra Tour’s official money list through the first seven events she played this season. Top finishers on the money list earn their LPGA Tour card at season end. While pushing herself to reach the next level, Meier takes time to appreciate the journey. Other players with state ties scheduled to participate in the Island Resort Championship are Laura Kueny of Whitehall, MI, who has won $79,176 in prize earnings thus far in her professional career, and Liz Nagel of DeWitt, a rookie last year who has earned $23,912 on tour thus far. Three-time college All-American Emily Tubert, a contestant on Golf Channel’s “Big Break Myrtle Beach,” is scheduled to compete at Sweetgrass later this month, and area star Brooke Ferrell, a University of Wisconsin All-Big Ten member will play on a sponsor’s exemption. Voted by Golfweek raters to the “America’s Best Courses You Can Play” by state list, Sweetgrass will host a field of 144 players competing for a $125,000 purse. The Island Resort Championship is also part of the Potawatomi Cup, a series of tournaments involving courses with Native American Indian or Potawatomi tribal ties, with the top finishers in those events earning additional prize money. Former Symetra Tour players have won hundreds of LPGA titles, including dozens of major championships. Dani Holmqvist won the 2015 Island Resort Championship with a 10-under-par total. Her performance contributed to her gaining full LPGA Tour playing privileges in 2016 with her season-long performance. Three-day grounds passes to the 54-hole event are $10 and include entry into daily prize drawings. Children 17 years old and under are admitted free with a paying adult. Tickets are available at Island Resort & Casino and at local organizations such as the Delta County Junior Golf Association and the NCA Guarantee Scholarship Fund. For a complete list of outlets visit http://www.sweetgrassgolfclub.com/symetra-tour-2016.All proceeds to local non-profit organizations. For more information visit www.sweetgrassgolfclub.com, or call 877-ISL-GREEN. The Symetra Tour – Road to the LPGA, is the official Qualifying Tour for the LPGA and enters its 36th competitive season in 2016. With the continued support of its umbrella sponsor, Symetra, the Tour’s mission is to prepare the world’s best young women professional golfers for a successful career on the LPGA Tour. Top-10 money winners receive full, equal status for the following season on the LPGA Tour. Owned and operated by the Hannahville Indian Community, Island Resort and Casino is located in Michigan’s Upper Peninsula. Boasting more than 1,200 slot machines and 24/7 Vegas-style gaming, the Island Resort & Casino offers craps, Blackjack, Spanish 21, Three-Card Poker, Let It Ride, Roulette, Bingo and more. The resort’s award-winning poker room features live action as well as a full tournament schedule. The Island hosts top entertainment headliners from a variety of genres in the intimate, 1,327-seat Island Showroom. Lodging options at the resort include finely appointed guest rooms, 14 elegant suites and a 42-site RV Park that opened the 2016 season on May 1. Drift Spa, Sweetgrass Golf Club and multiple restaurants offer other appealing options. The property is easily accessible via a pair of regional airports in Escanaba and Marquette and is also an easy, scenic 2-hour drive from Green Bay (four hours from Milwaukee). (PETOSKEY, Mich.) – BOYNE Golf – home to 10 premier courses spanning three resorts in the heart of “America’s Summer Golf Capital” – has made two new appointments at its 27-hole Bay Harbor Golf Club. Robert Fuhrman is the club’s new general manager, bringing more than 30 years’ experience with Boyne Resorts to the position. A 26-year member of the PGA of America, Fuhrman has excelled in a variety of golf roles across BOYNE’s portfolio of properties. Most recently, he was Bay Harbor’s head golf professional from 2001 to 2015. Steve Niezgoda has stepped into Fuhrman’s vacated role as head golf professional. No stranger to Bay Harbor, Niezgoda spent time with the club as an intern before beginning his full-time professional career with BOYNE as an assistant golf professional. Steve returns to Michigan from Maine’s Sugarloaf Resort, a BOYNE-managed property where he was the Director of Golf, Retail and Rental. This year marks Bay Harbor Golf Club’s 20th anniversary. The byproduct of a massive land reclamation project, Bay Harbor brought the first lakeside, five-star resort golf experience to the region. The club boasts three distinct nine-hole courses – The Links, The Preserve and The Quarry – all designed by Arthur Hills. The Links is reminiscent of Ireland’s famous seaside courses with six holes overlooking Lake Michigan; The Quarry winds its way through an immense, abandoned shale quarry; and The Preserve features stately trees towering over native grasses, wild flowers and wetlands. The 18-hole Links / Quarry combination is regularly ranked among the U.S.’s top 100 public courses by Golf Digest and GOLF Magazine. With courses designed and inspired by renowned architects like Hills, Robert Trent Jones, Sr. and Donald Ross, BOYNE Golf’s three flagship resorts offer experiences to suit players of all ages and abilities.